I gathered five of these curly stems, wrapped another stem around the ends and attached them to the top of the bottle with hot glue. I dip a brush in the Disco Dust and tap the brush … a little goes a long way! I wish you a happy and safe New Year! Thank you to SweetWorks for the box of surprises! Don’t you just love using a fan brush with disco and luster dust? It’s my favorite tool when working with the edible dusts. Your cupcakes are so pretty. Pinning. Awesome. Where can I get that chocolate bottle from? What is in it? Happy 2014 to you, the peanut butter man, sons 1,2 and 3!! Thank you Dinaz 🙂 I got the bottle directly from SweetWorks … call them and ask for possible locations near you … and it’s 14 ounces of milk chocolate … I should crack that baby open! Are you working with the same camera, Brenda? These photos are really good. 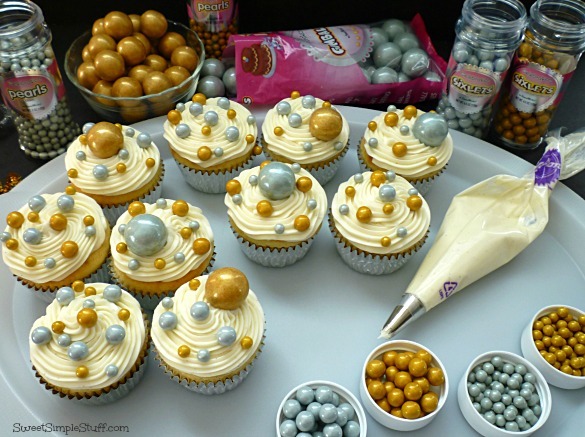 What a deceptively simple idea for decorating the cupcakes! Thank you Kathleen 😉 Same camera … I moved closer to a different window … maybe it helps. You know how I operate … simple! I love the decorations on the cup cakes. They look so awesome. What is in the Silver Container? And where do you get the gold glitter from? Thank you Anna 🙂 The silver container is empty … it’s an old cocktail shaker. 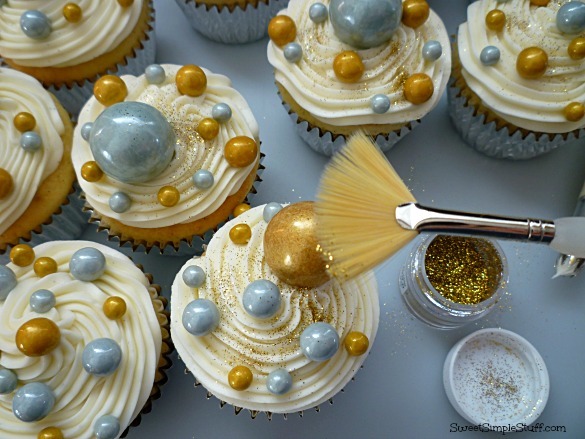 I bought the gold glitter at a cake decorating supply store … there is probably something very similar at Michael’s or Hobby Lobby in the cake department … or there is always Amazon! 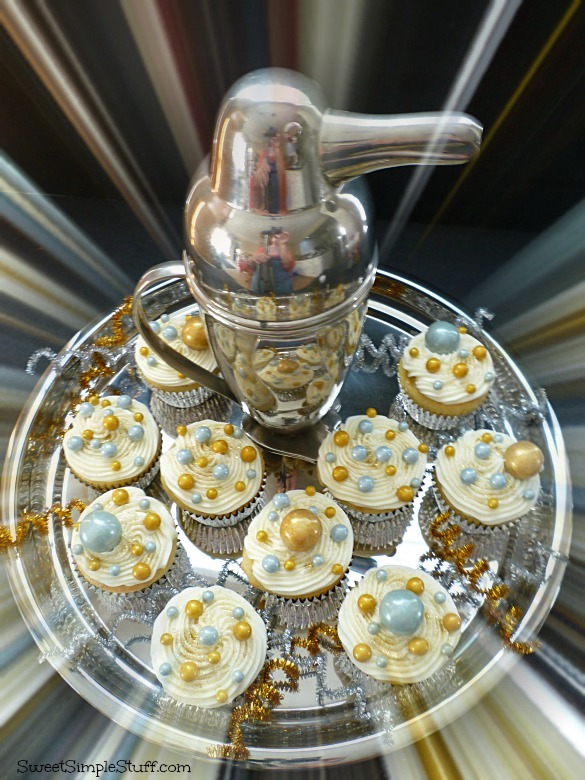 Sadly, the disco dust is not edible because it’s plastic craft glitter–even though it’s sold in cake deco supply shops. It’s to be used on decorations that will be removed before eating–the same way you’d remove candles or plastic toys. 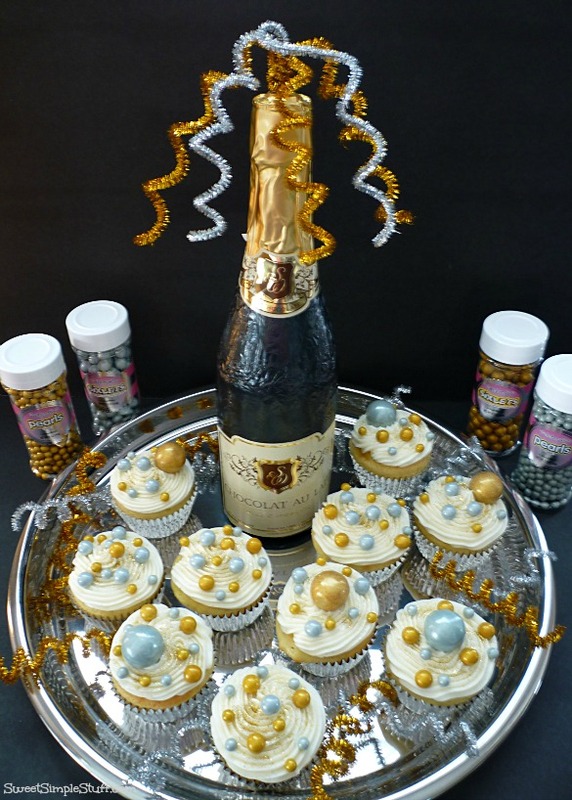 Edible glitter is available in the cake departments of hobby stores, but it’s not plastic and it’s made from sanding sugar, gum arabic [cake sparkles], or gelatin. Thank you Rae 🙂 Edible glitter is an edible alternative to disco dust … kind of falls into the same category as silver and gold dragees. Thank you Ellen 😉 You know that your brother has “tried them out”!!! 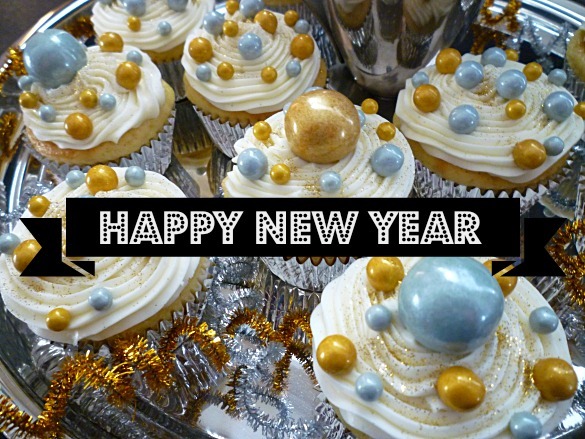 My favorite way to celebrate the new year, well, it’s just about my favorite way to celebrate anything – with glitter! Love the cupcakes! Thank you 🙂 I agree … glitter is a good thing! Brenda, I love that last photo, so cool the way the lights are hitting the balls and making beam of lights. Fast and fun idea for the new year. Wishing you a super 2014! Enjoyed looking at this. You are impressive! Happy New Year to you and the family! There may have been a swallowing problem with dragees for children, but you’ve given us a wonderful alternative – Sixlets & those glorious gold & silver gumballs. Your “champagne” table is beautiful. That luster or gold dust really puts the finishing touch on everything. 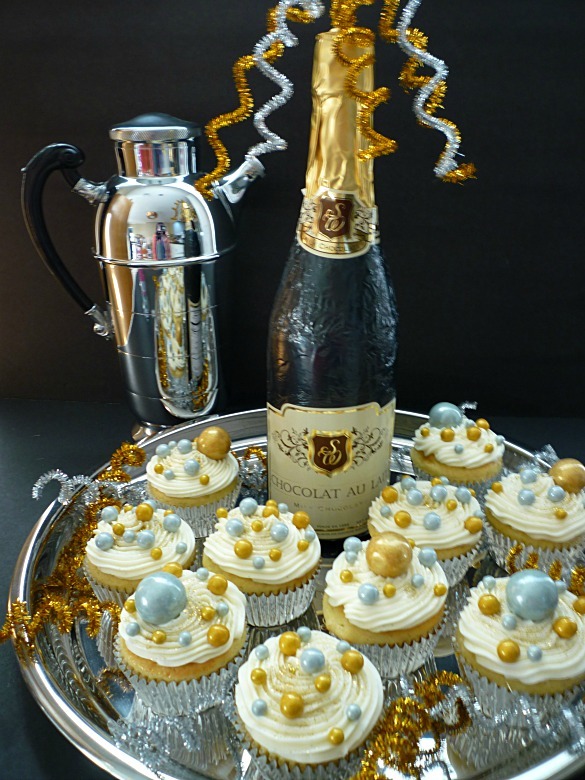 Adds elegance to an already real pretty cupcake. 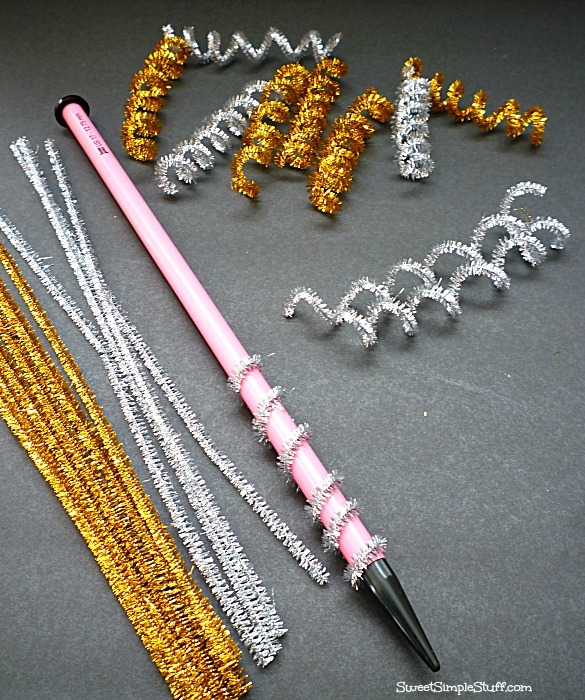 For the kids you could wrap a bottle of Coke or Sparkling Water in aluminum foil and then just use gold pipecleaners. Very festive. 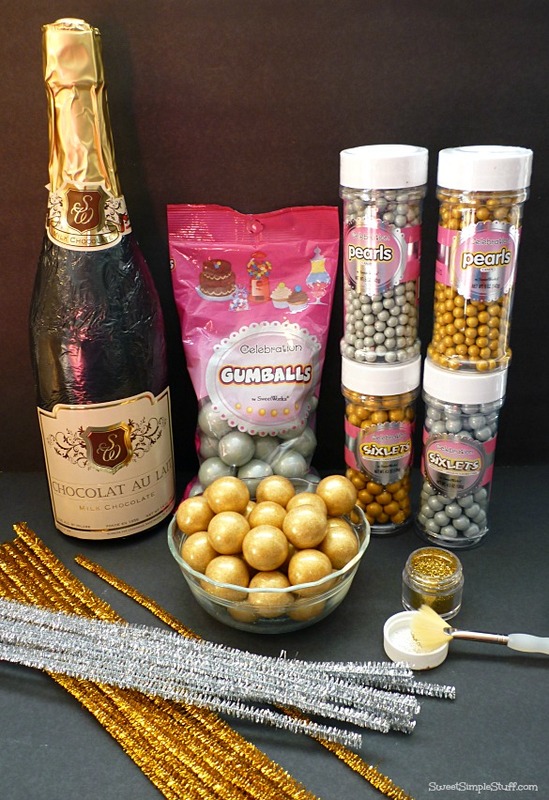 Thank you Tavette 😉 I think my alternative gold and silver decorations work quite well … gumballs, candy and kiddos go together!